Oh, your parents: Teh Olds. They're always needing technical assistance with the most rudimentary computer tasks. Worse, you can't begrudge them the tech support since they're always helping you out with rides to the movie theater and money for ice cream. You can't deny them service, but goshdarnit, you should demand remuneration for your travails. And if you do it as adorably as this young tech entrepreneur, we're willing to bet you're going to get what you asked for. 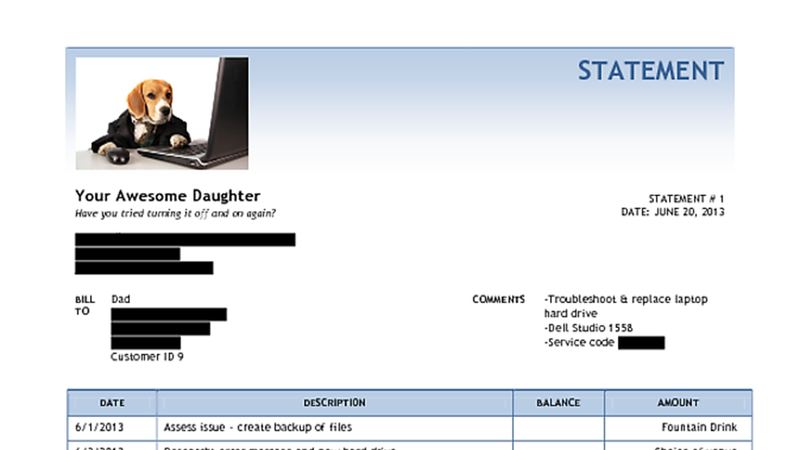 Reddit user Clem_Honeybutter, the proprietor of the fledgling business "Your Awesome Daughter", posted the bill she recently delivered to her father. Here's the damage, all professionally itemized and everything. Waiiiiiiit....In exchange for the labor of changing a laptop hard drive, she asked for only pizza, parmesan twists, and a fountain drink from Round Table? What a bargain!